Hi there Crafty friends, big post for you today. I have two easel cards and another beaded suncatcher I made recently (prior to Christmas!) for a family member that I mentioned previously I would share with you. Hope you all had a fabulous Christmas and New Year with family or friends. Christmas day here was spent relaxing with family, we had a lovely BBQ this year instead of a traditional roast. I took a break from webbing while hubby was on 3 weeks of Holli’s. We had our new fridge delivered and then connected up for the water and ice feature on Christmas eve and also had a sink mixer installed, but we ended up with a minor flood in the cupboards below because one of the seals was faulty and it ended up the mixer was faulty too. Our plumber came back a few days after Christmas day to fit another one.. this one is as good as gold silver! Finally had a 80 foot pine tree removed (in the property at the back of our block) that was on a severe lean towards our house… eek! In high winds, I have spent many nights with one eye open.. worrying about this tree coming down and taking out the back end of our house. It looks strange seeing a big void were it used to be. We have had sudden gusty winds lately coming down from the hills, and recently the top section of Hubby’s tower (the antennas) came crashing down with one of those gusts. 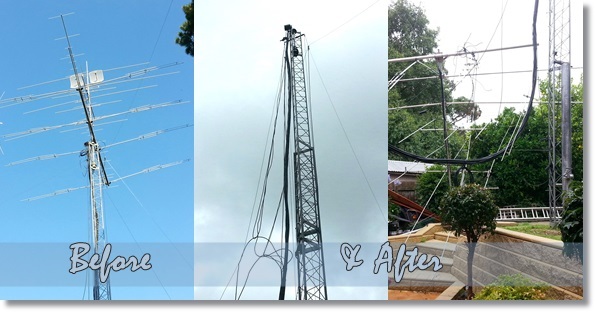 Unfortunately hubby spent most of his Christmas break fixing the antennas and cables. 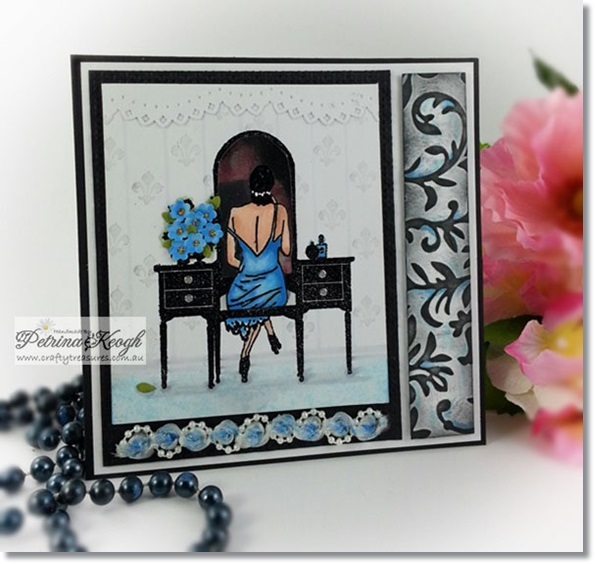 Finally for today’s projects, the main image was stamped (for both cards) and heat embossed with a B Line UM rubber stamp called Dressing Table, it’s one of my favourites. I coloured them both with Copic markers. You can see that there are slight differences with the background and the die cut decoration at the top. Here is both easel cards propped open. 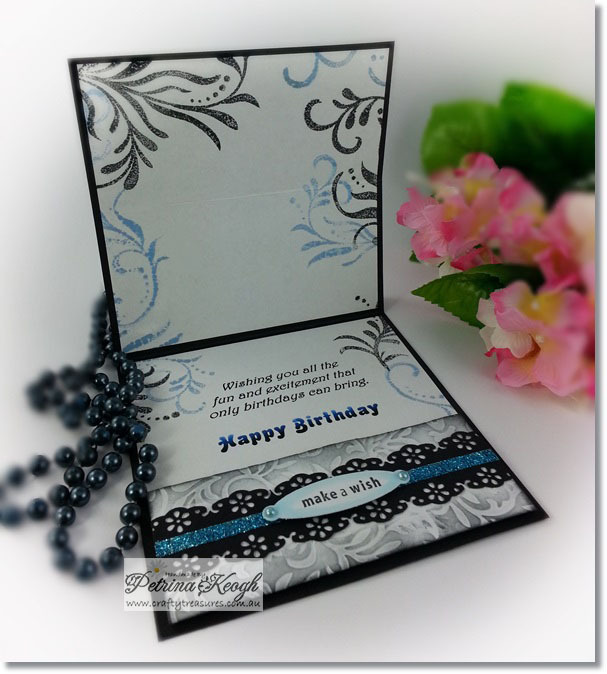 The main panel on the right hand side was embossed with Cuttlebug – Embossing Folder/Victoria. 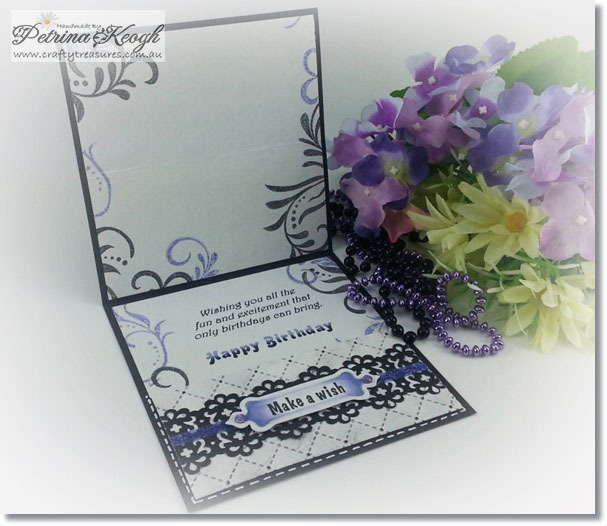 There are also slight differences between these two as well using different die designs and embossing folders to decorate them. 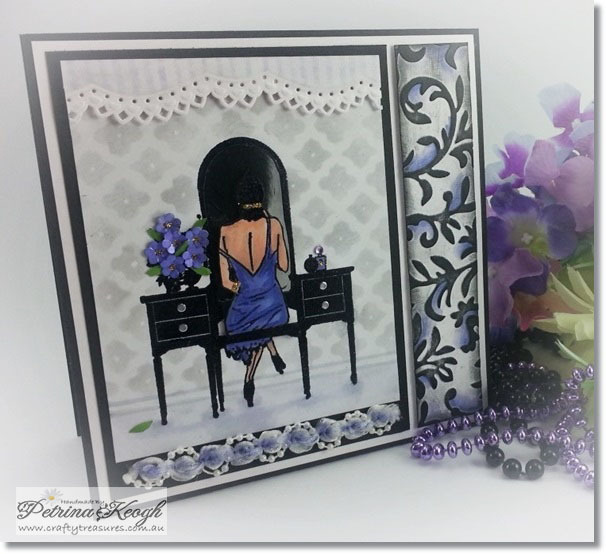 Here’s both easel cards fully open, both stamped with matching ink colours to suit both designs. The inner wording was PC generated. 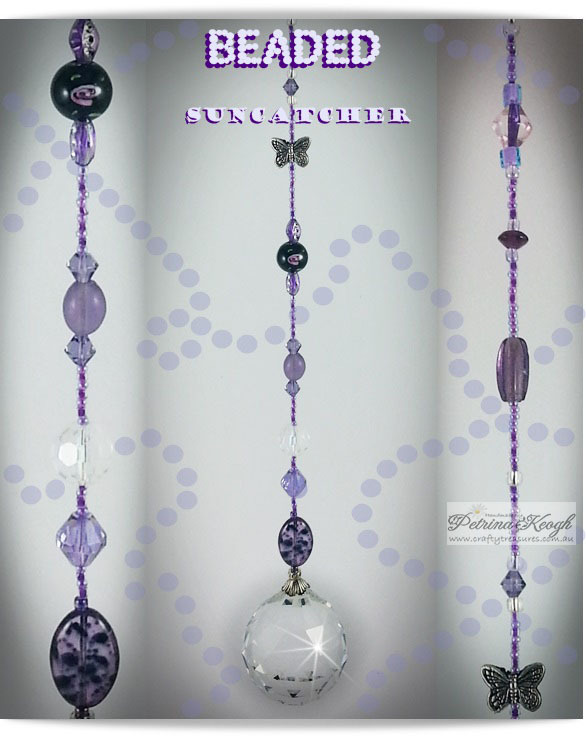 Here is another suncatcher I made up with purple beads to go with the purple easel card for a birthday gift. I did not have a wide variety in purple coloured beads, but glad I managed to get it finished with what I had. Here is another funny pic I took a while ago while gardening with hubby recently! The pic speaks for itself! They are fairly robust and re-shooting already. 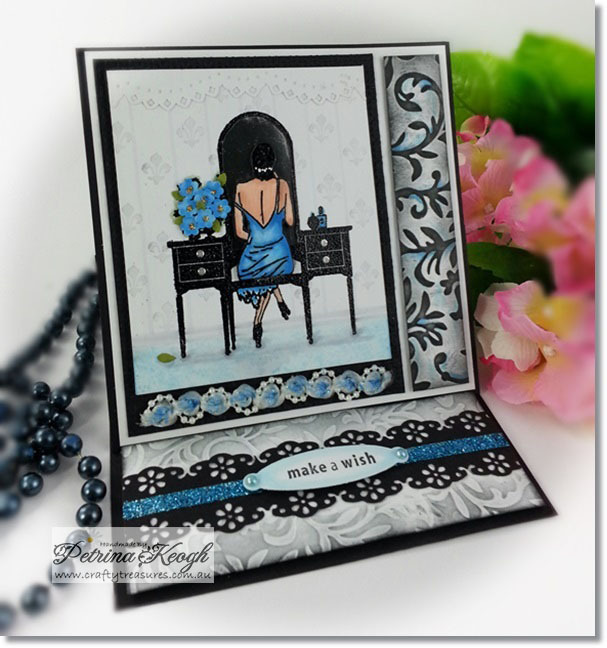 Previous post: Sizzix Iron Gate Fun….